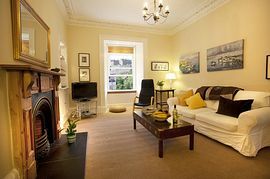 We are very pleased to offer our lovely flat for your special stay in Edinburgh. There are 3 full-sized double bedrooms (2 doubles and a twin-bedded), as well as a large sitting room, equipped with 2 sofas, chairs, a 32inch TV and A DVD player. The kitchen is as large as the other rooms and has a dining table to seat 6 people(8 if you want to invite guests). We do not expect you to have to sleep in the sitting room. The benefits of living up here are apparent as soon as you are in the flat. It is light and spacious, with a wonderful view of the granite crag and the castle, straight ahead from the living room window and from the bedroom at the front. Carlton Hill with its Folly(this is straight on from Princes Street). There are 2 theatres and a concert hall across the road - so close you could come home for you interval drinks. These are The Royal Lyceum Theatre, The Usher Hall and The Traverse Theatre. 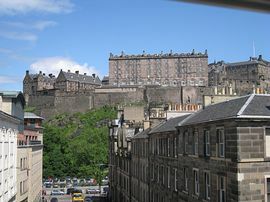 When you make your booking I will send you more details on what to enjoy in Edinburgh. A stunning view of the Castle through the window. 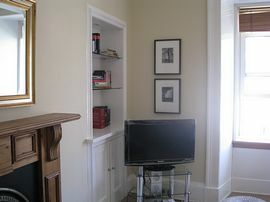 Walking distance to most central attractions. 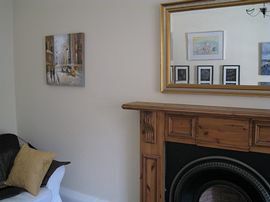 Local Services: This is a city centre apartment, so there are many shops and services available, including theatres, concert hall and cinemas. Our flat is about 20 minutes to half an hour�s walk from Waverley Station, west along Princes Street, and then a left turn into the Lothian Road. You could also take a cut across Princes Street Gardens, below the castle heights. If you arrive by plane, the best way into town is by shuttle. Get a return ticket for £6 (one way is £4). This will drop you off at the top of the Lothian Road, near the end of Princes Street. It is then 10 minutes walk to the flat. Low Season: £660.00 per week. Mid Season: £760.00 per week. High Season: £860.00 per week. Peak Season: £1,300.00 per week August and New Year. Rates for stays of 3 or 4 days are available on application (with the exception of August and New Year). We have just started marketing our apartment, so it will be available from Friday 30th July 2010, onwards!